Take an odyssey through the King’s career with the Avengers writer! 1917 to 2017: 100 years of Kirby. Join us this month to celebrate Jack “King” Kirby’s 100th birthday by learning about the characters and stories he created that changed comics forever. To commemorate Jack’s centennial, we’ve sat down with the modern-day creators he influenced—and the decades of work he gifted us all. Even legendary artists can take a little getting used to. Your reaction can all depend on exactly when you first experience their work and the kind of art you had seen up to that point. While Jack Kirby remains one of the most beloved creators in the comics world, not everyone fell in love at first sight. AVENGERS and CHAMPIONS writer Mark Waid happened to be one of those exceptions when he first read a Kirby comic. However, he soon became enamored with the style and kinetic energy that makes the creator “King” to this day. Fully converted towards the Kirby aesthetic, Waid has written many of Jack’s most prominent co-creations including Captain America, Hulk, the Fantastic Four, Ka-Zar, S.H.I.EL.D. and numerous others. We talked with the writer about that first less-than-great initial exposure, developing a love for Kirby, and his tendency to always look back at the master’s original stories. Marvel.com: Do you remember the first Kirby-drawn comic you read? What was your relationship with his work like as a reader? Mark Waid: It wasn’t a Marvel book, but rather a DC one—and to my eternal shame, I hated it when I was nine. I’d grown up with staid DC illustrators like Curt Swan and George Papp, and Jack’s [work] looked all “wrong” to me. Luckily, I grew up and saw the error of my ways. Marvel.com: Did you get to know Jack personally? What surprised or impressed you most about him? Mark Waid: I had one conversation with him, casually, at a convention in Dallas a million years ago. I was amazed by his humility and his accessibility, and listening to him tell war stories was a revelation. Marvel.com: Jack has three distinct runs on Captain America. Did you have specific takeaways from each one that you incorporated into your time with the character? Mark Waid: Yes. The Golden Age material taught me action. The TALES OF SUSPENSE era work taught me soap opera. 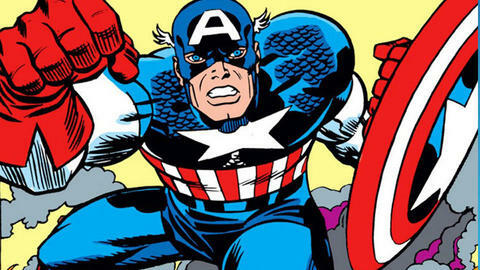 And his mid-1970s run on Cap taught me the value of big, bombastic, all-new villains. 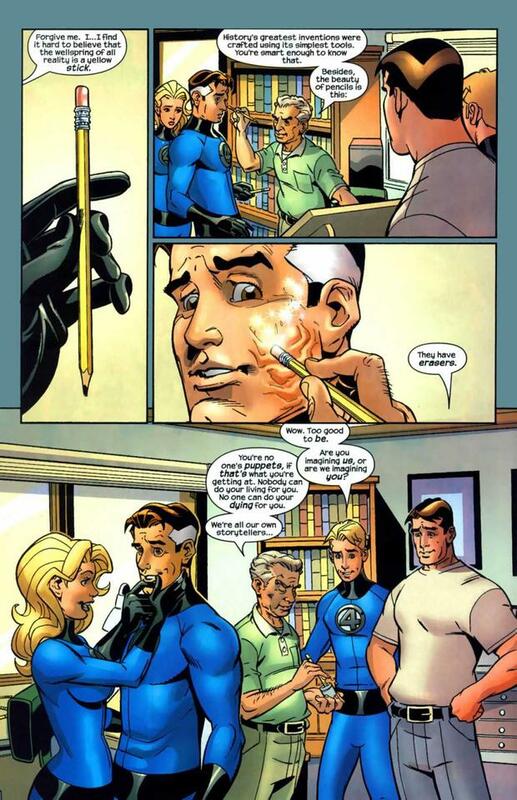 Marvel.com: You worked with the amazing artist Mike Wieringo on most of your FANTASTIC FOUR tenure. His style might not have looked like Jack’s but he perfectly captured the characters and that world. Was that something you sensed going into that collaboration? Mark Waid: Absolutely. I knew Mike respected “The King” immensely, and Mike’s work was big and bold to match Jack’s. Marvel.com: You’ve had very well regarded runs on some of Kirby’s greatest co-creations. Why do you think you’re able to tap into what makes these characters tick so well while also taking them on new adventures? Mark Waid: Because they’re great characters, one and all. My job is to dig down and rediscover what I love about these characters and then show it to you. And Kirby’s creations and co-creations are so emotional, so human at the core, that it’s almost impossible not to be able to tap into them. Marvel.com: You made Jack Kirby a “Higher Power” in FANTASTIC FOUR #511. He has these great lines about imagination and story. How much of that came from Jack and how much came from your own experience working on comics? Mark Waid: At least half of those lines came from Jack quotes. His phrasing, his language is unique. In my mind, Jack was not especially articulate and yet incredibly well-spoken. He twisted words like no other comics author, and yet their meaning was always clear, always strong and on-point with a distinct flavor. Marvel.com: You also incorporated the “Man Called Death” pilot pages into S.H.I.E.L.D. #9. How was it working that into the tale and how does it feel to have most likely given some readers their first exposure to “The King”? Marvel.com: When working on books that feature direct Kirby creations or legacy versions—like INDESTRUCTIBLE HULK, S.H.I.E.L.D., or the Avengers books—do you look back at his original runs to get a better sense of what makes them tick? Mark Waid: No question. The advice I give all writers is to always go back to ground when you take over existing characters and get a sense of why they’ve been pop-culture icons for all this time. You’re looking for that “X-factor” that the creators brought to the table so that you can find a way to modernize it without disrespecting it. If you’re ever stumped on a “take” for a character, go back and study author intent. The secrets are there. Stay tuned to Marvel.com for more throughout Kirby Month and beyond! And join the conversation on all of our social channels with the hashtag #Kirby100.